Untame dish duty with this prickly hand-sculpted pal. How many dishes could a hedgehog scrub if a hedgehog could scrub dishes? This hand-sculpted sponge holder will not only keep your sink organized and sponge dry, but will also keep you company during dish duty. 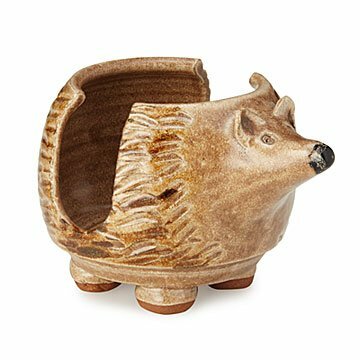 Each prickly pal is crafted from sturdy clay that is carefully etched and painted. Handmade by JoAnn Stratakos in Pennsylvania. Keeps me company while I'm working in the kitchen!!!!! I was looking for a way to store my sponge on top of the kitchen cabinets and the hedgehog sponge holder simply spoke to me. Its maker, Joann Stratakos, does a wonderful job in her creations. The hedgehog makes me smile when I catch a glimpse while doing work in my kitchen. I like it so much that I might order a couple more to give as gifts!! Everything was fantastic and on time. My sons, girlfriend is fixated in hedgehogs and works in a shelter, and will love this. To hold a kitchen sponge.